An organized classroom not only helps teachers feel less stressed, studies show it also promotes better learning. From organizing your space to supplies and papers, here are some tips to keep things running smoothly. Don't get lost in a pile of paperwork! Set up a file system on your desk using four categories: To Do, To File, To Read and Pending. For students, create baskets where they can turn in completed work and assignments, keeping that paperwork separate from your own. Start by grouping like items together. Markers, crayons, paints and pencils can be stored in an over the door shoe organizer with each color being stored in a separate pocket. The pockets also work well for glue sticks, erasers and other craft items. You may also want to consider filling divided caddies with art supplies that can be taken to work stations. Another idea is to use stacking drawers to create a supply station for dry erase markers, pens, rulers, stickers, tape and staplers. These can be used on a shelf or along a wall. Attach a chair pocket to the back of each student's chair. These can easily be made from a shopping tote or even a pillowcase. You can also attach a small open bin to the legs of each chair with zip ties, giving each student a place to put supplies. Keep a to-do list and prioritize tasks by labeling them A, B or C (with "A" being the top priority and "C" the least). 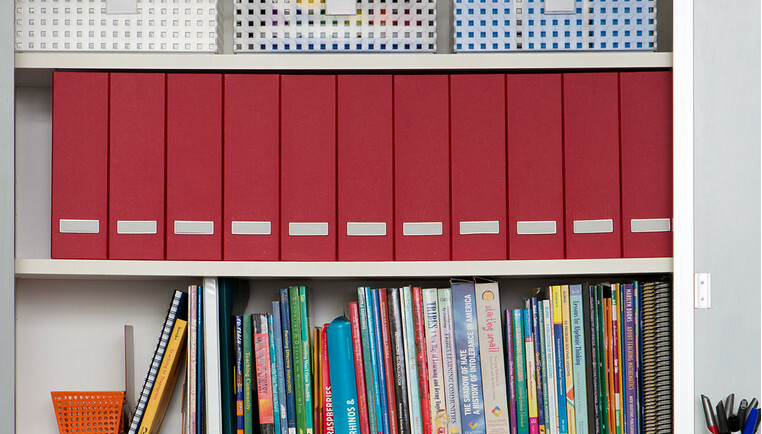 Organize materials needed for class each day using colored file folders and storage boxes. Opt for portable filing solutions that kids can use to store and easily access writing journals or portfolios. They'll learn responsibility and it can help you save time! One thing many classrooms don't have is a lot of storage space. Invest in a shelving system like InterMetro Shelving that is easy to assemble/disassemble if you'll be changing classrooms. A tall unit (measuring 74") can provide generous storage since it uses a lot of vertical space that is otherwise wasted with low shelves. Use the top shelves for storing items you don't access regularly. Choose clear boxes for storing supplies so there's no guessing what's inside. Also label them so you know where things should be returned. Stacking boxes will maximize what space you have inside a cabinet or on a shelf. If you have multiple types of large boxes for storing units or seasonal items, consider changing over to just one. A uniform look, particularly for large boxes that are out in the open, goes a long way to create a sense of order in the classroom. Enlist the help of parent volunteers to help you transfer materials from the old boxes to the new ones. Share the boxes you're no longer using with other teachers.